Happy Friday! I love it when I get to start my post off with such a positive message, don't you? Friday's are always so exciting, knowing that we have a few days off from the hustle and bustle (...well most of the time). If you are one of the lucky ones that have time on your hands and would like to partake in a quick and easy project, I have a wonderful recipe that will have your mini-me thanking you all weekend long. 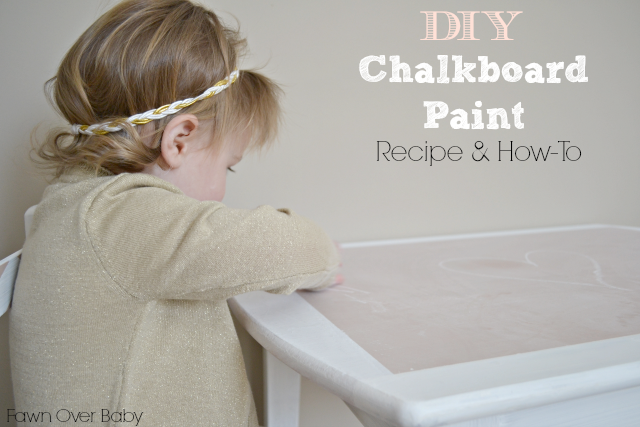 A few weeks ago, I shared a tutorial on how to make your own CHALKpaint when I updated McKenzie's toddler table and chairs. Well today, I decided to kick it up a notch by adding chalkboard paint to the top of her table. 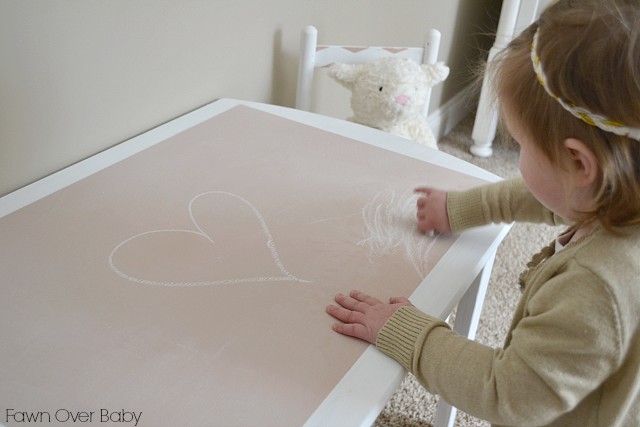 She looooooves outdoor chalk, so I thought why not add a chalkboard to her tabletop and allow for a little indoor chalk play too? Especially when we get those rainy weeks here in Georgia, this would make for the perfect rainy day activity. The only thing that I was a little hesitant about was the color. I didn't want the normal black or green and I wasn't 100% sold on the color options that I found at my local hardware store, so I did a little research and found that you can easily make your own color chalkboard paint! Thanks to the wonderful ladies over at A Beautiful Mess and their easy tutorial on how to make your own chalkboard paint in any color, I was able to whip up a batch in no time at all! I had most of the ingrediants from my chalkpaint project, so I only spent a little over $2 (on a sample size paint at Lowes) for this project! yey for savings! 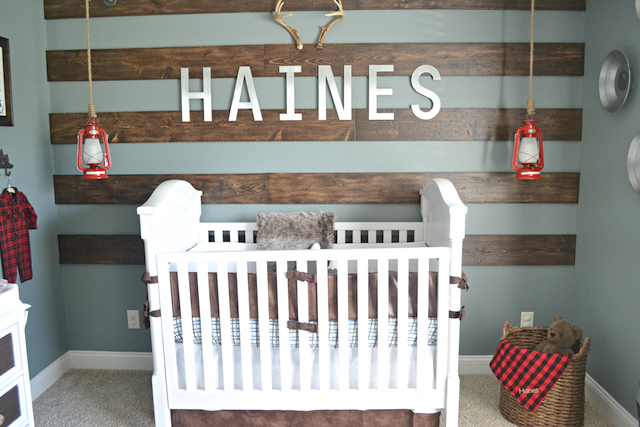 It turned out so adorable and coordinates so well with the over all color scheme in McKenzie's room (nursery reveal coming soon!). 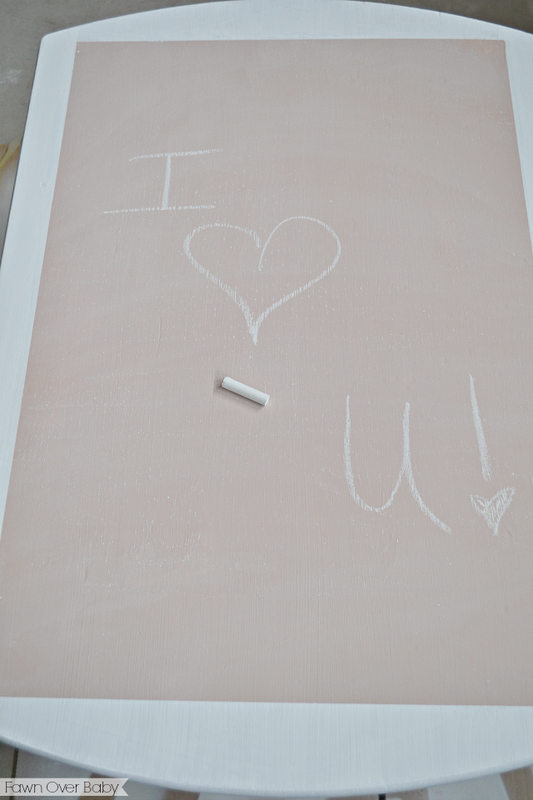 All you have to do is add the color of choice and your chalkboard paint is ready to coordinate any space in your home! :) So let's get to it!! 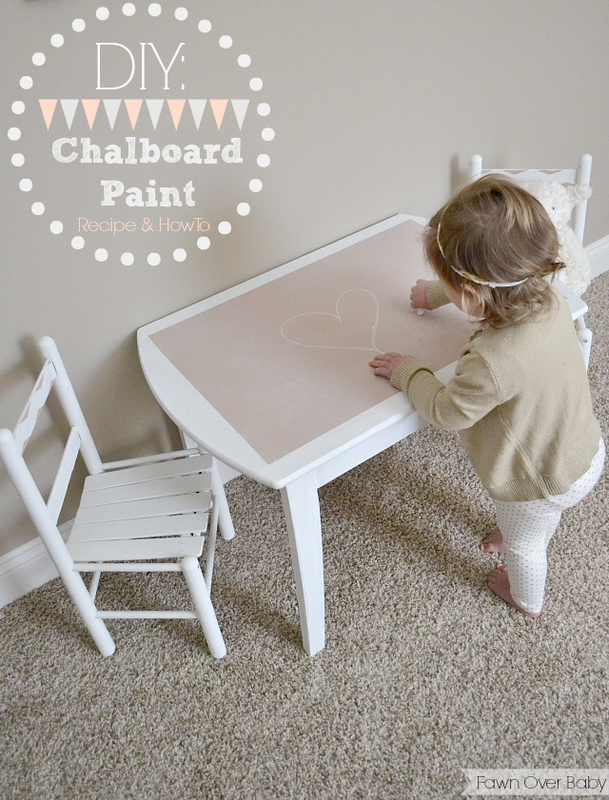 How To Make Your Chalkboard Paint in Your Color Of Choice! 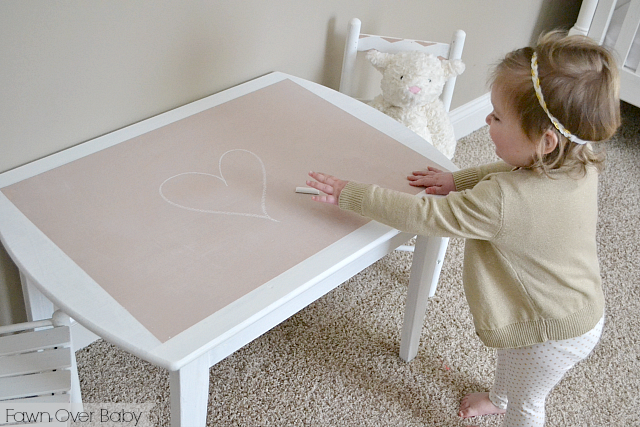 Condition your chalkboard by going over entire area with a piece of chalk then wipe off. THAT'S ALL FOLKS! 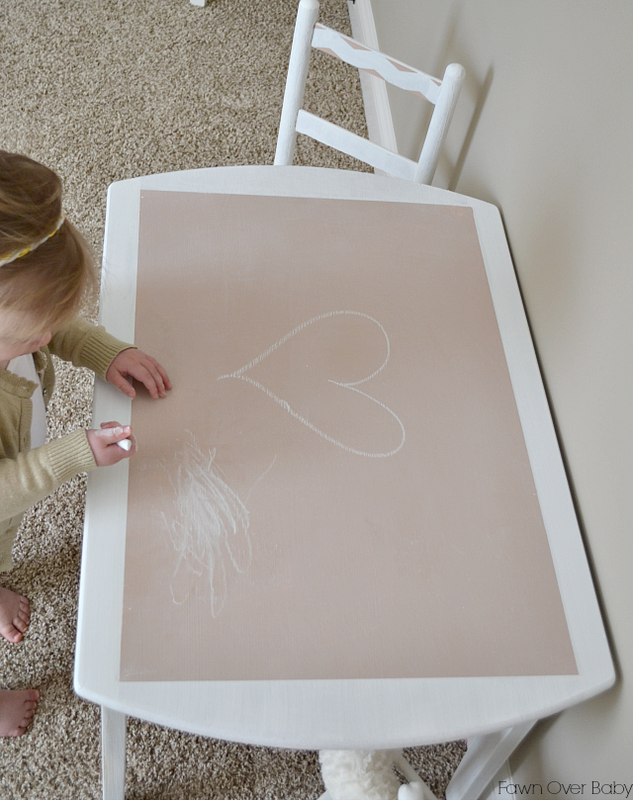 Your Chalkboard Is Now Ready To Display Your Chalk Art! 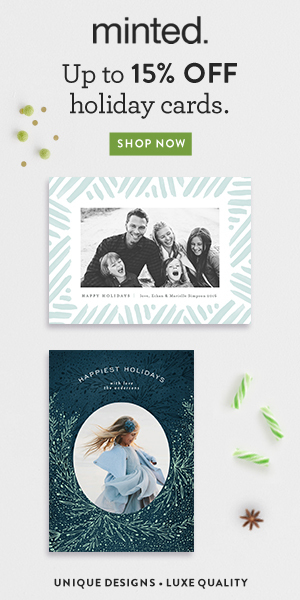 Love this idea and not having to use the traditional black. I am going to IKEA this weekend and might buy the little table and chair set to try this. What color of pink is that? I LOVE it. Thank you Chrissy! It's called Desert Travels from Valspar. I just picked up a sample size($2 and some change). It made plenty and I still have a lot left over :) I hope you'll share your little's table! !